Yep, that is a (lovely Instagram) photo of the university admission letter I received today! Actually, I checked the university's website yesterday to find out I was admitted, but I wanted to wait for the letter before announcing it. And I just confirmed that I take the study place offered, so I am officially going to university this Autumn! It is not a huge surprise, but let's give it a round of wohoos. So, in just a month (!!!) I will be starting at the university. 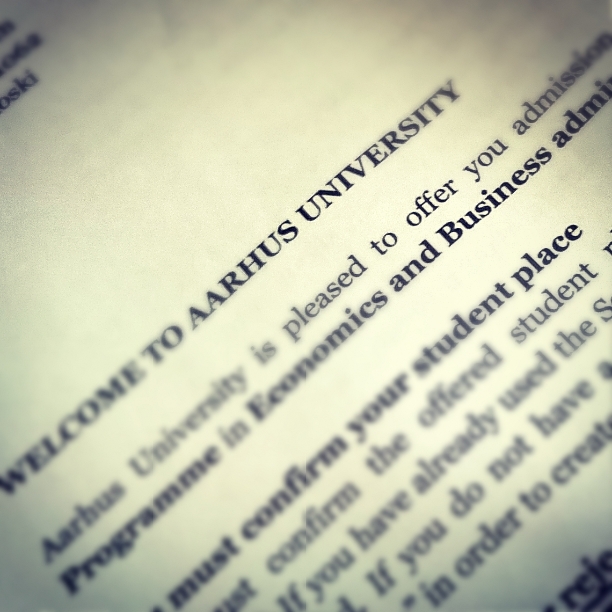 The university I got accepted into is in Aarhus, Denmark and it was my number one option, so it worked out perfectly. There is so much things I need to do before, most importantly get an apartment! Bank account, telephone subscription, bed... All the things I am going to need! August is going to be so hectic. I know I have not been very active on this blog lately, but now it is to change. I have had not much to blog about recently, but obviously with this new chapter in my life lots of interesting things are going to happen. This is exactly the reason why I originally started this blog: To follow my journey living in a foreign country and other things related. So now we are getting to the point! I am still wondering about starting vlogging, but at least here in this blog, I will be talking about my experiences. This post may seem a bit messy, but that is how my head feels like currently with so many things to take in consideration. But there is definitely lots and lots of interesting things to come starting from 1st of September, so stay tuned!